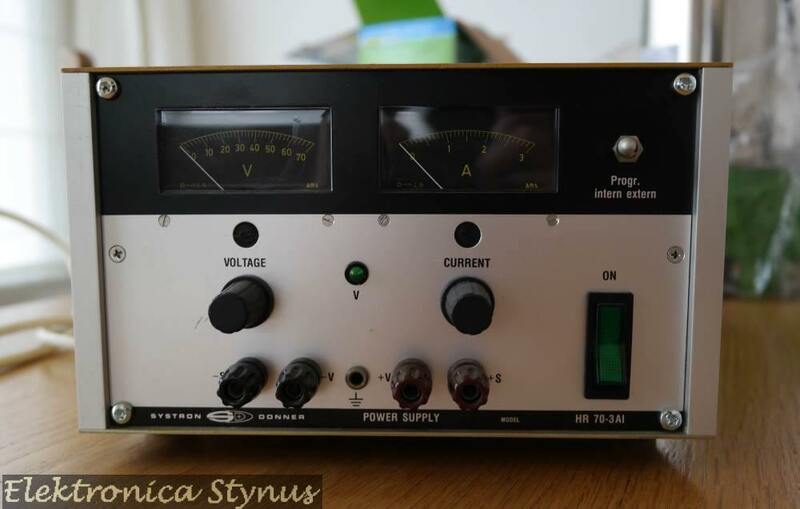 A few years ago I bought a second-hand Systron Donner HR 70-3AI power supply. 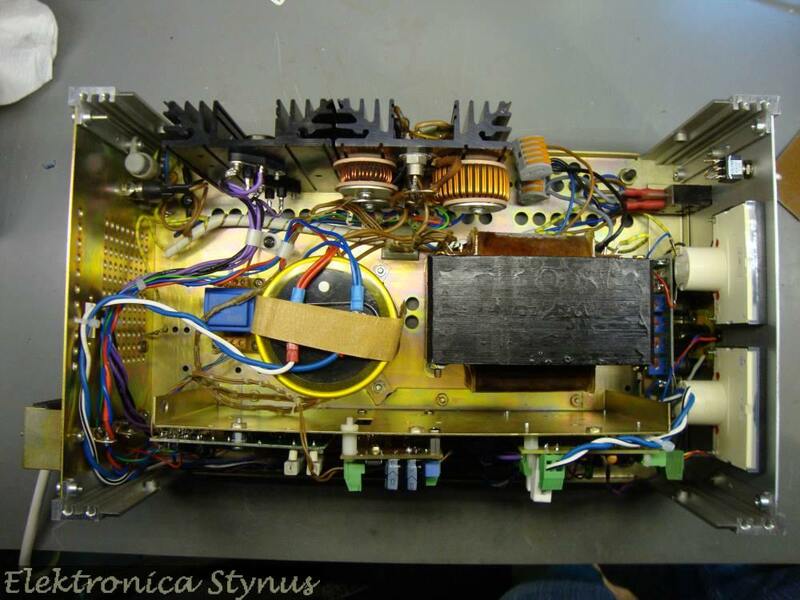 This power supply works with a pre-regulation by “dimming” the transformer to limit the power dissipation. 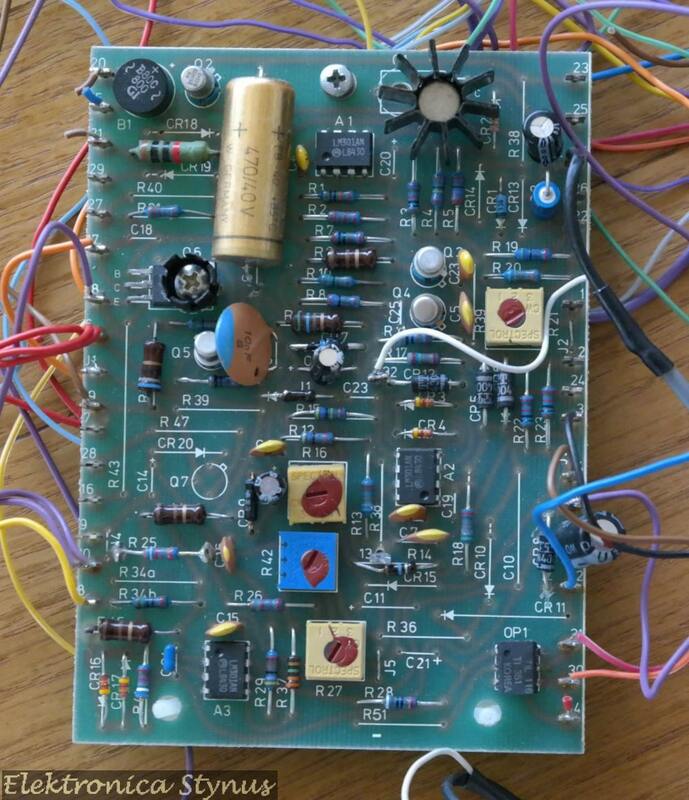 This works ok, but the psu has a rather big output capacitor (3300µF), which makes it unsuitable for testing circuits. 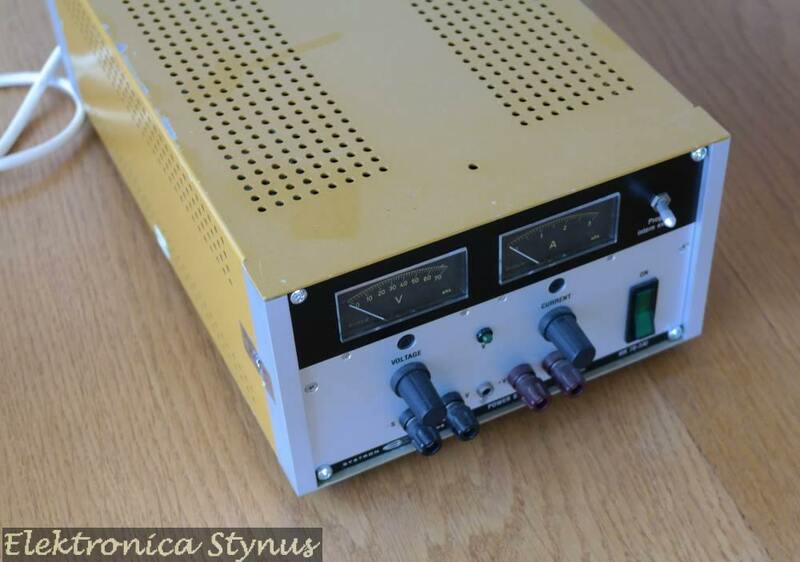 After a few months the psu broke down, and instead of fixing it I decided to upgrade it by adding a new lab power supply part. 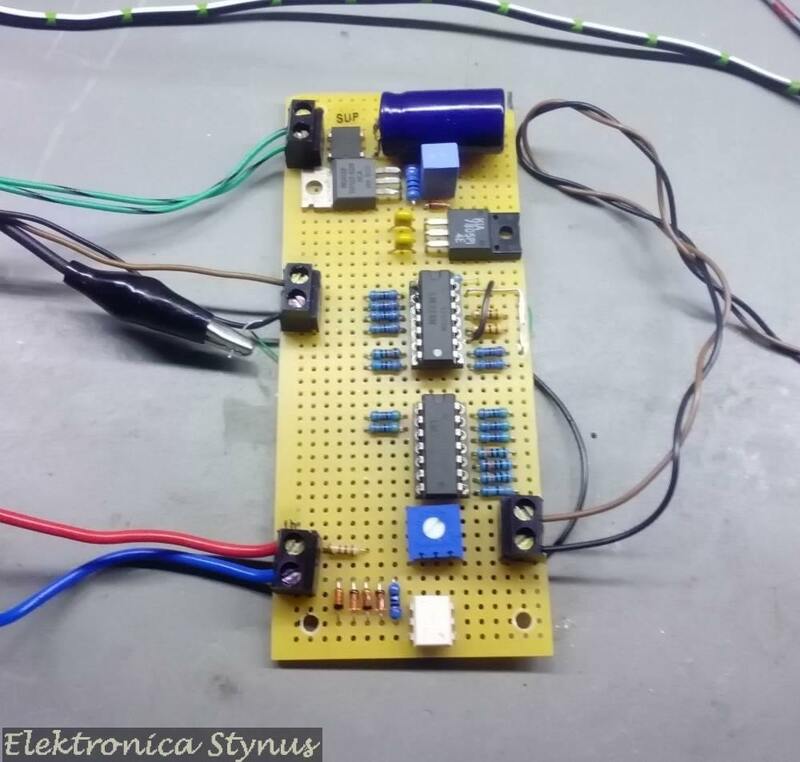 For this I used a board I got from an action on circuitsonline. 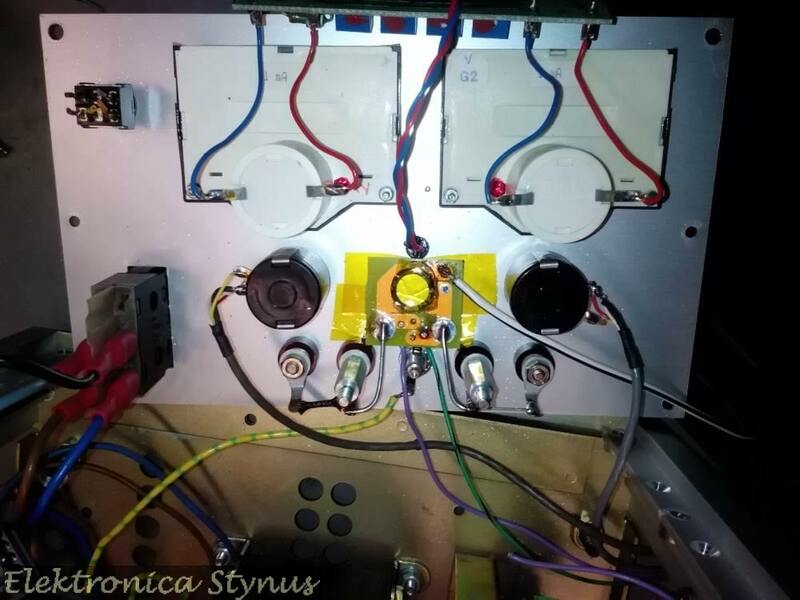 The heat sinks are rather small and can not handle the 210W (70V x 3A), therefore I decided to reuse the pre-regulation and have it regulate about 10V above the output voltage. 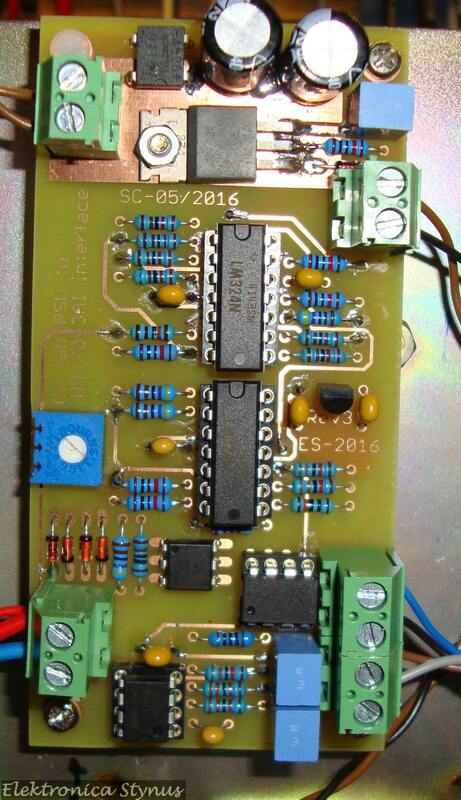 For this I designed an interface circuit. 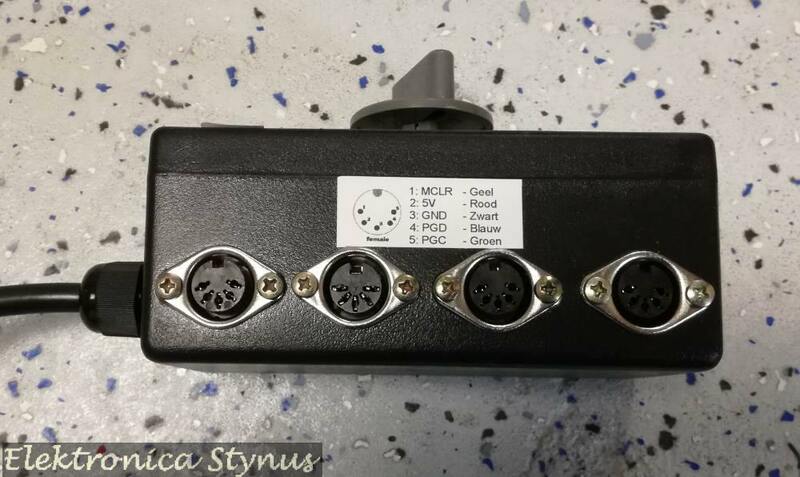 The potentiometers are changed to different values. On the outside nothing has been changed to the enclosure. My new workshop is in my basement. For the hand washing / board cleaning “corner” this has the disadvantage that it is below the sewage level. In order to drain the water it needs to be pumped up. I had a few pumps from old washing machines laying around and decided to do some experimentation with this. 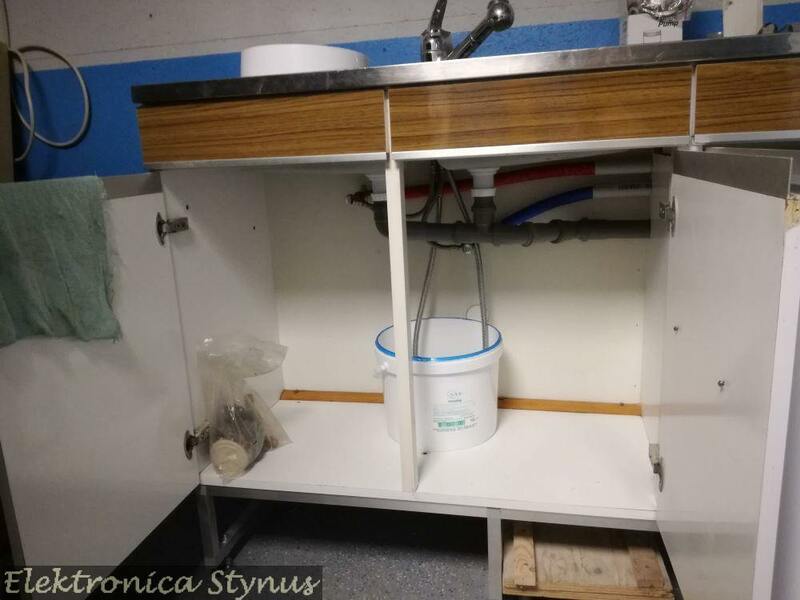 To make it easier for the pump (and to spare my back) I made a frame underneath the cabinets to raise the whole thing by 20cm. This way the water needs to be lifted less. Normally there is a siphon after the drain in the sink, this part I have taken out and brought the pipe directly to the pump. At the pump side the pipe goes down a bit in order to make the check valve work better (Picture further down on the page). 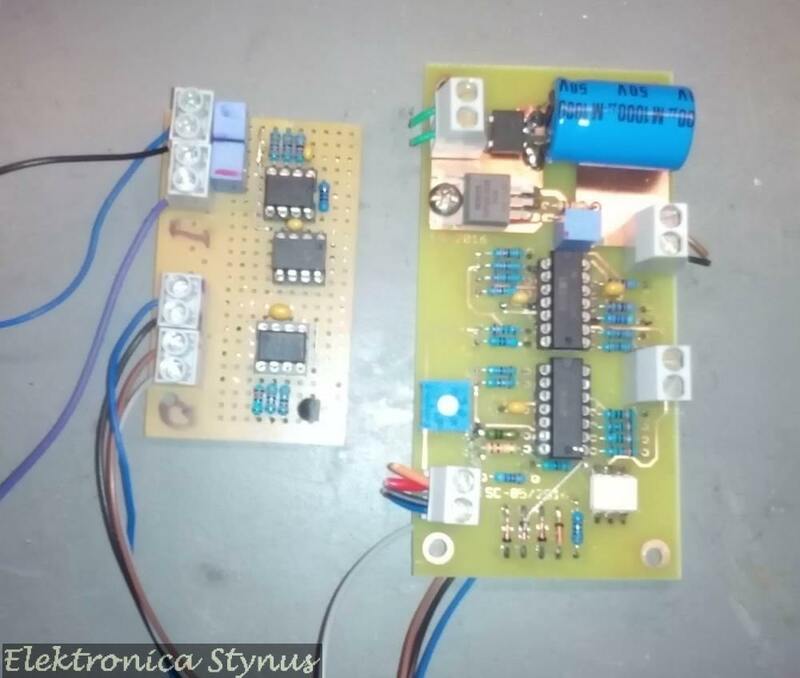 Also because of this the sensor is not mounted at the lowest point. 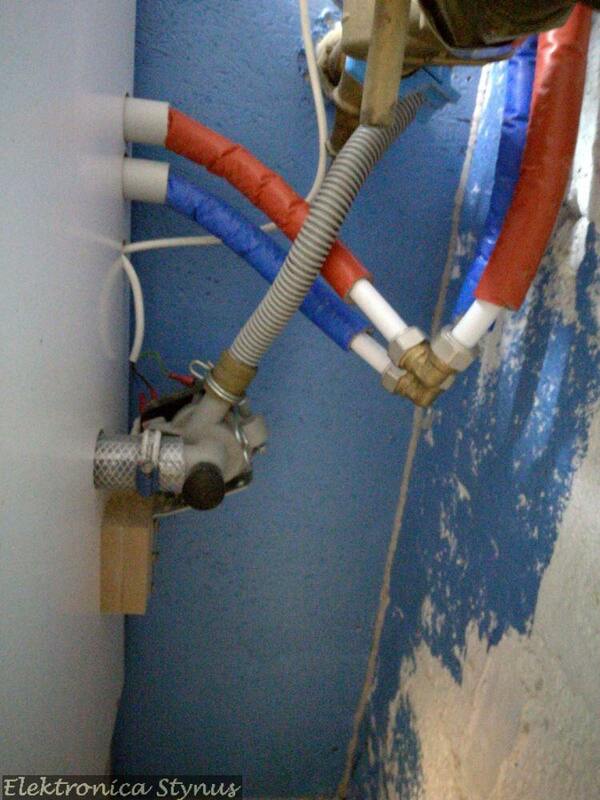 This makes it work better since the pump does not clear all the water from the pipes. The water that does stay in the pipe may false trigger otherwise. 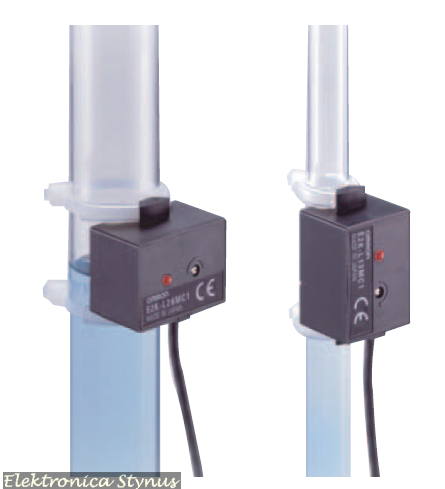 However this means that the pump needs to operate longer when the sensor signal go’s off. 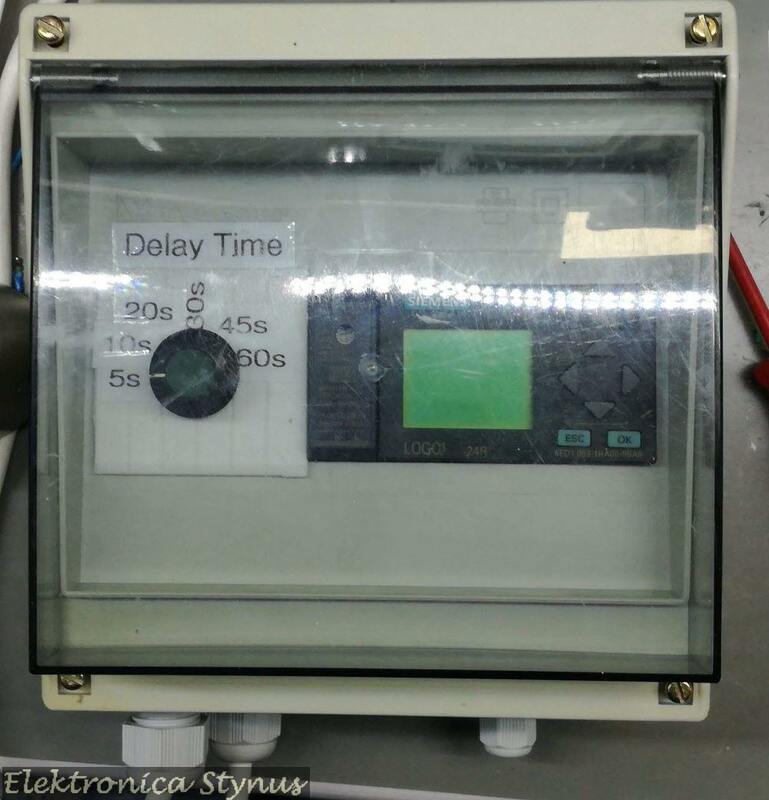 Therefore I made a timer box. 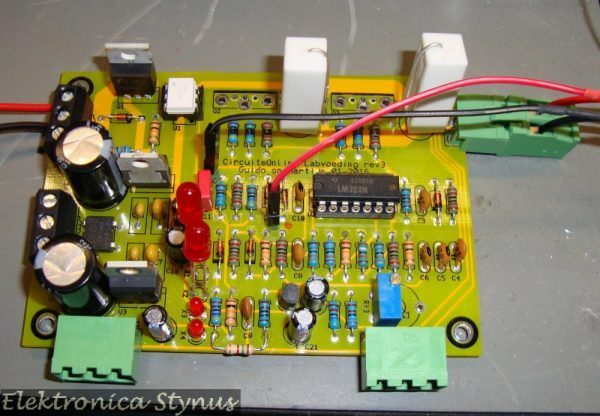 This was made with a Siemens LOGO The time is settable by a rotary switch. 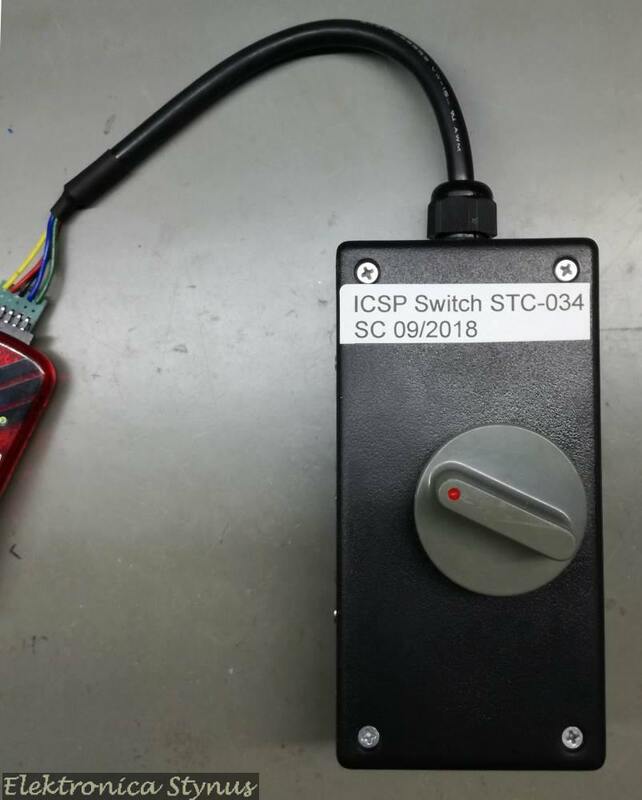 This switch is connected with a few inputs of the LOGO. 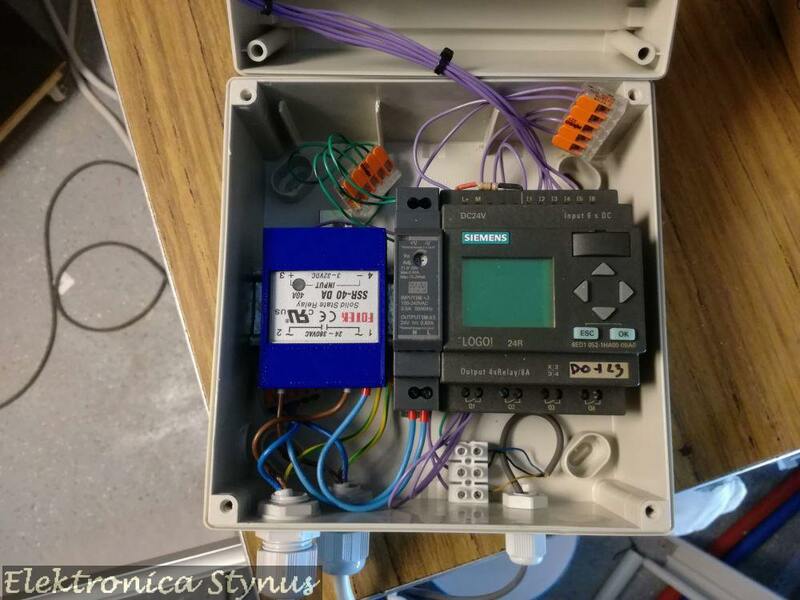 To detect the water in the pipe I used a E2K-L26MC1 capacitive sensor from Omron. 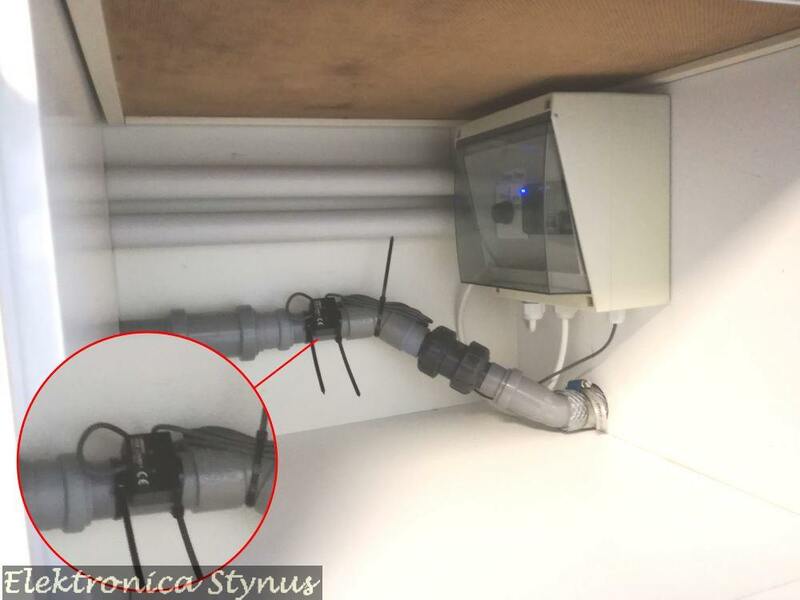 This sensor can be clamped around the pipe and does not come into contact with the water. 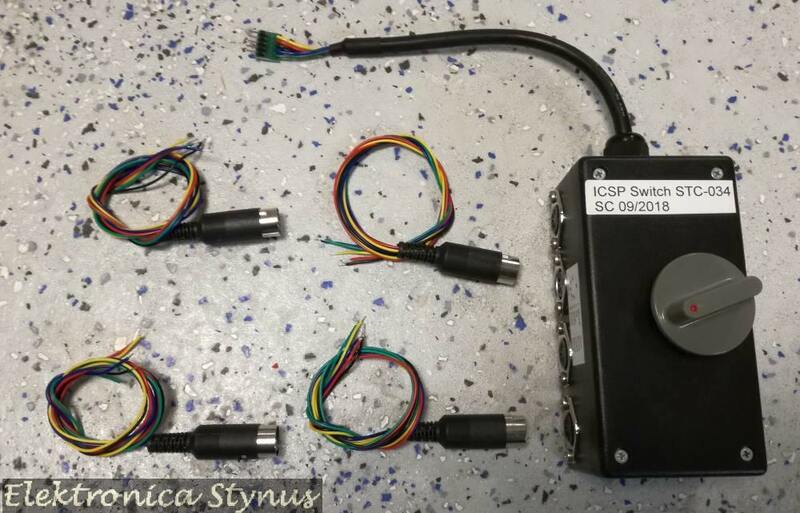 This sensor has an NPN output, while the LOGO is only compatible with PNP output sensors. 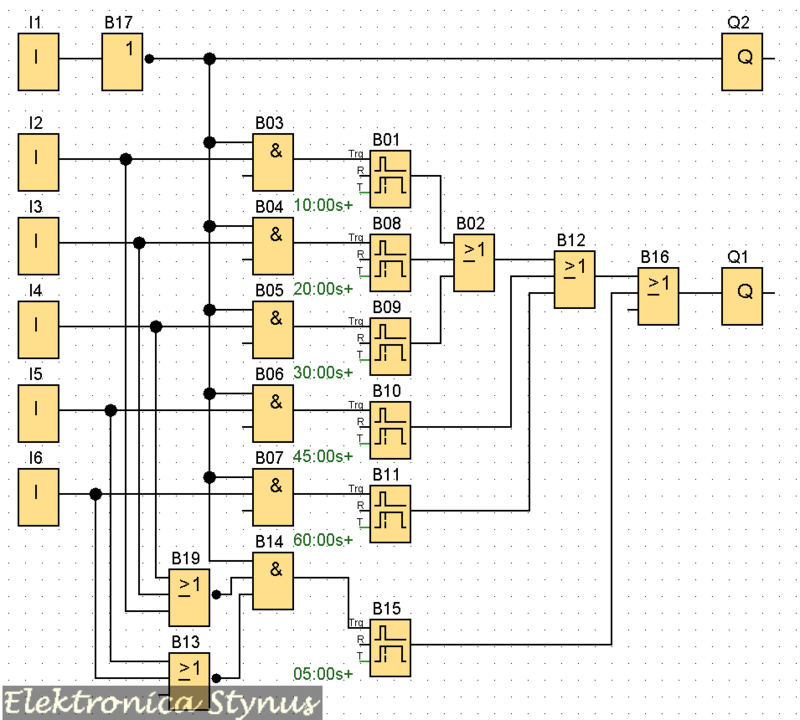 This I solved by adding a 10K pull-up resistor between out and +24V. After this the input needs to be inverted in the LOGO to work correctly (B17 in the program above). 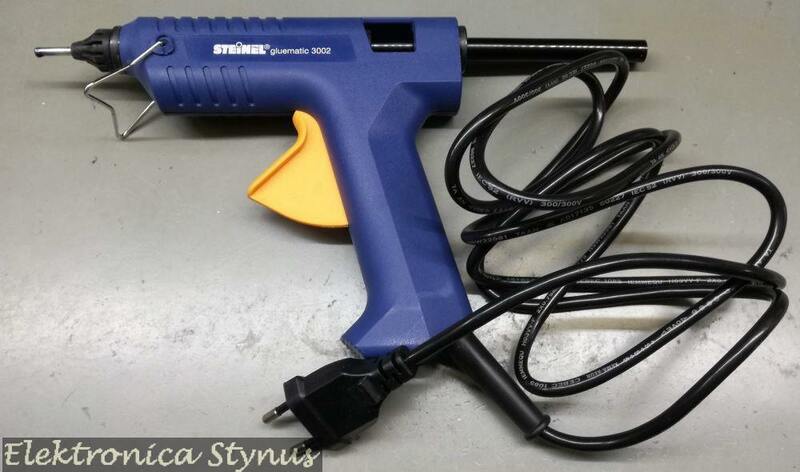 I have a Steinel Gluematic 3002 hot glue gun. 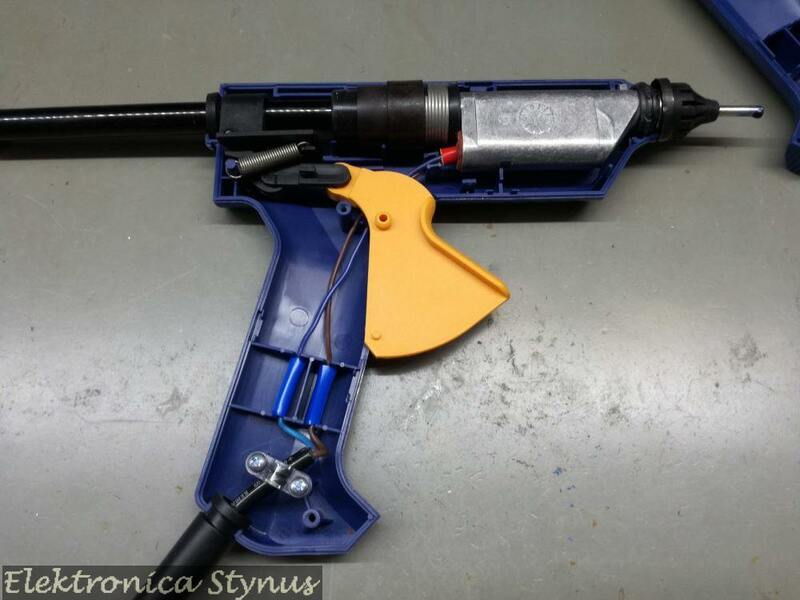 This glue-gun itself I’m fairly happy about, but the mains cable is much too stiff. This causes it to tip over from the force of the wire. Therefore I decided to replace the cable with something more flexible. 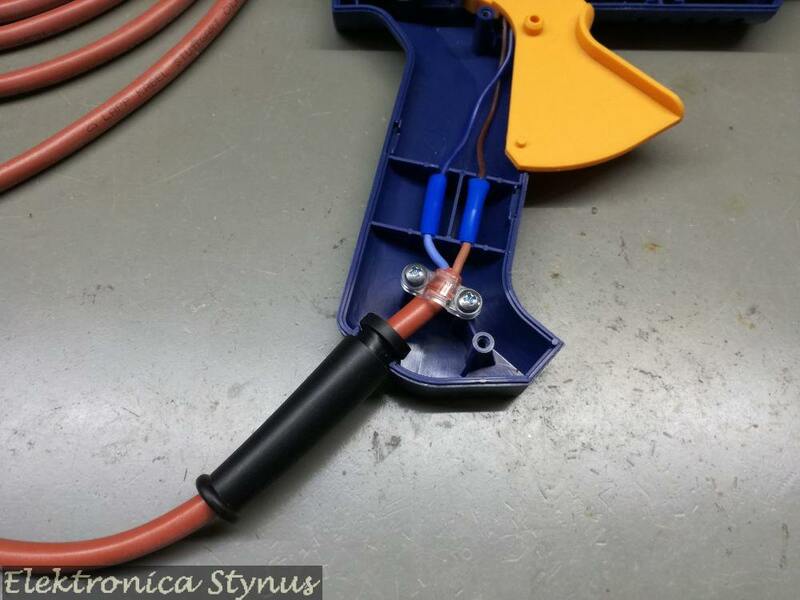 I came across some silicone rubber wiring. 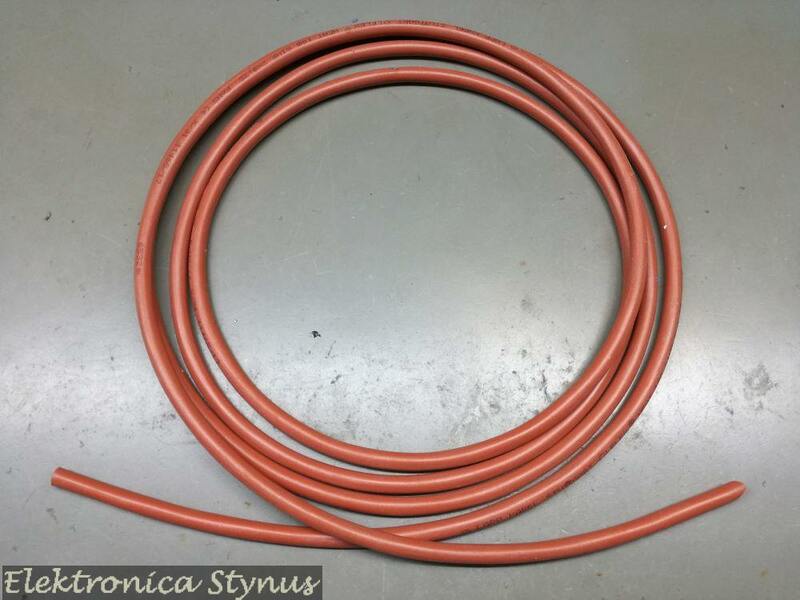 This is very flexible, but also is heat resistant. This means it will not get damaged if I accidentally touch it with the hot nozzle. 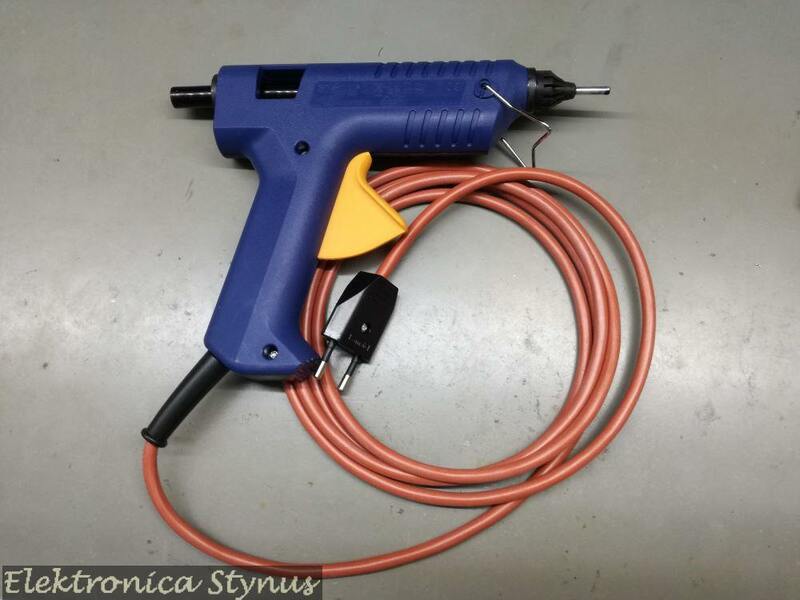 After opening the glue gun it turned out to be very easy to replace the cable. 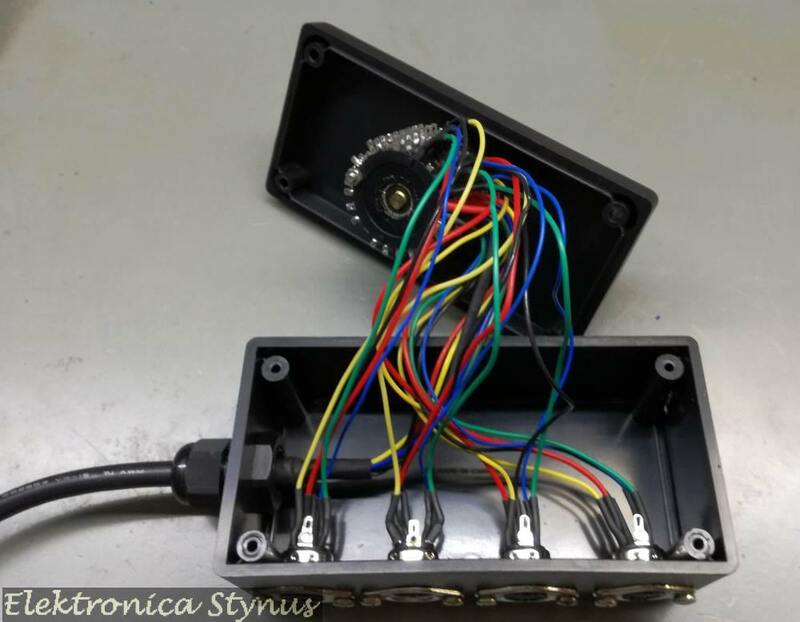 The strain relieve was not molded to the cable and the wires to the heating element where just crimped to the other wire. This modification makes it much easier to work with.